This level has medium difficulty. 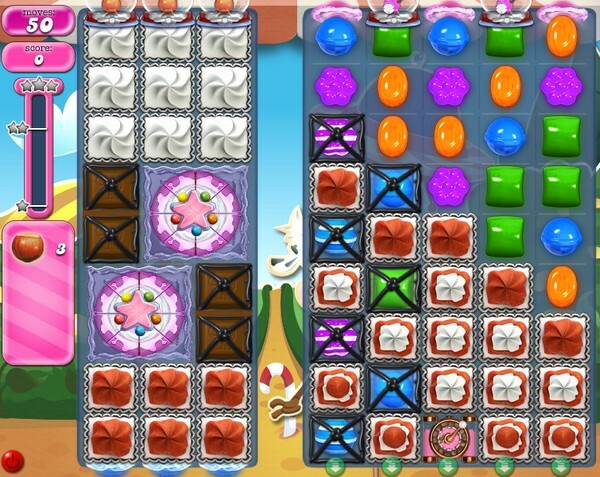 For this level try to play from left part of the board where more candies are available to play and make special candy as you get the chance. Combine them with each other to break more blockers and make special candy as you get the chance. Try to use striped candy to move ingredients or play near to ingredients to move them and take them out from the board. Really,25 moves? Why do I have 15 on iPad? In your video you have 50 movies? How in the world can I beat this with 15? WOW 50 moves in walkthrough ? Compared to my 15 moves?????????? Well I must say this is getting funnier and funnier and even funnier. Here it is 2019 and still only 12 moves. Impossible! I first had 9 moves. Did the up date got a wooping 15 moves. Not 50 or even 25. This is so wrong. Cutting the moves in this level from 50 to 15 shows kings greed beyond words. We finally pass awful level 1995 and face this impossible level. Do they have so many customers that they are torturing their best players to quit? Shame on king! 2005 completed! 1st board! Break cakewheels. Disgusting starting this level with 50 moves and for players to get so far playing this game having to put up with the moves decreased to 12. Ready to leave CCS again until Kings play fair for all players. Going in wrong direction…I only havw 11. Spent hours trying to find answer. No issue on my end, It is King’s responsibility. My second try with this game. Spent quite a bit the first time, then game froze on me after 1000 levels. Finally gave in and started over, haven’t spent much this time, then I hit level 2005…..I only get 11 moves and others are getting up to 50?. If this is not addressed I will be quitting this game and will not try for the third time. Good luck getting assistance from King,why should they care as long as we keep playing. They are still making MONEY and that appears to be thier bottom line it sure isn’t customer service. All my help has cone from the blogs. These levels are horrible. When you look at the walkthroughs they Show moves then you actually have. 12 really?? I’m so tired of this!!! I haven’t said it for this level. There are more before??? Only 12 moves – have not gotten close more than a few times and have been playing same level for a week! Do not see how it possible in so few moves! Will delete game soon if I don’t pass it! Absolutely impossible I have 12 moves on iPad. Not sure if this comment is helpful.Totally finished with candy crush. I only have 12 moves – Why does it say 25 and some videos show 50????? I only have 12 moves on my IPad and IPhone. Have been trying for 5 days to beat this level. I am even using up my hard earned boosters! This game is not able to complete! Very frustrating!! Please help me..y have only 12 moves..Thanks yo very Much!!!!! How is this possible with only 12 moves? Why is this always happening????? I also only have 12 moves. According to prior comments, this issue has been going on for a couple years. I have only 12 moves.Pls help. Heb maar 12 zetten in plaats van 50 zetten , dat is wel een heel groot verschil , dat haal je nooit !!!!!!!!!!!!!!! II have only 12 moves , please help !!!!!!!!!!!! How can I finish this level with 12 moves? I’m only getting 12 moves instead of 50 on level 2005. Whats the deal? This is impossible to do in 12 moves. WHY DO I ONLY GET 12 MOVES? ON THE WALK THROUGH, THEY GET 50? PLEASE HELP ME! Only 12 moves – impossible! I’m giving up with this game. No fun anymore. GREED should be King’s name! !